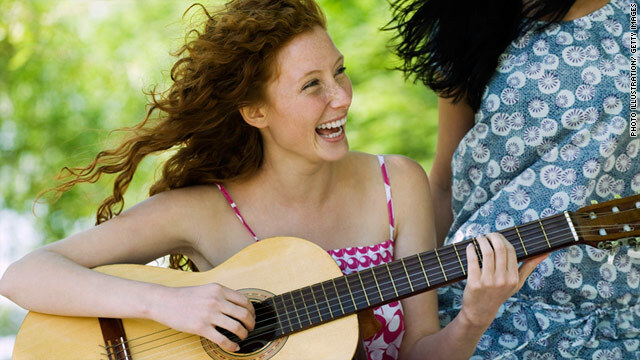 Researchers found that people who took part in sessions built around music or laughter lowered their blood pressure. But music and laughter alone aren't sufficient to treat high blood pressure. (Health.com) -- Listening to your favorite tunes or funny jokes could lower your blood pressure, perhaps even as much as cutting salt from your diet or dropping 10 pounds, according to the preliminary results of a small study presented Friday at American Heart Association meeting in Atlanta. Though relatively modest, blood-pressure reductions of the size seen in the study have been linked to a 5% to 15% lower risk of death from heart disease or stroke, says Michael Miller, M.D., director of preventive cardiology at the University of Maryland Medical Center, in Baltimore. "I think there's definitely a physiological effect going on, some sort of mind-heart connection," says Miller, who was not involved in the new study but has conducted similar research. Researchers at the Osaka University Graduate School of Medicine randomly assigned 90 men and women between the ages of 40 and 74 to receive hourlong music or laughter sessions every other week, or no therapy at all. The three-month decline is in the range of what could be expected in someone adopting a low-salt diet, losing 10 pounds, or taking a blood-pressure-lowering medication, Miller says. He adds, though, that music and laughter alone aren't sufficient to treat high blood pressure. "This is a great natural tool to improve your health, but I wouldn't recommend replacing medication," Miller says. "Although it could increase your likelihood of going off medication or reducing the dosage." And in a previous study, Miller and his colleagues showed that both laughing and listening to upbeat music improved the function of the inner lining of blood vessels, causing them to expand by 30%. (Watching or listening to unnerving movies or music -- such as the opening scenes of "Saving Private Ryan"-- had the opposite effect.) Nitric oxide released in response to laughter or music might be the "magic compound" that dilates blood vessels and lowers blood pressure, Miller suggests. Vera Brandes, director of the research program in music and medicine at Paracelsus Medical University, in Salzburg, Austria, says that music and laughter may affect blood pressure through different pathways. Music is believed to influence the parasympathetic nervous system, which relaxes the body and slows the heart rate, she says, but more research is needed to understand how humor affects a person's emotional -- and, in turn, physical -- response to stress.